The Skinny: Adapted from the work of Masamune Shirow, this groundbreaking sci-fi anime remains a must-see film for fans of Japanese animation. Although its philosophical ramblings may be a little taxing and its plot a tad opaque, there are few anime films that can beat Ghost in the Shell in terms of pure action, world building and atmosphere. Set in the not-too-distant future, Ghost in the Shell introduces us to a world in which technology has taken over our lives in ways beyond checking Facebook and Twitter every thirty seconds. With a few rare exceptions, most humans in the world of Ghost in the Shell have undergone some form of cybernetic modification, many becoming full-on cyborgs in the process. The “shell” of the title seems to refer to a human being’s corporeal self (even if it’s more machine than man) whereas as the “ghost” is, for lack of a better term, the soul – or for a less religious slant, the “data” that makes up one’s personal identity. The central conflict of the narrative involves the so-called “Puppet Master,” a cyber-terrorist that turns out to be the next generation of Artificial Intelligence. As luck would have it, the Puppet Master has emerged from the primordial stew of the internet with a fully-formed, self-generated consciousness. Like its most obvious cinematic forbear, Ridley Scott’s Blade Runner (1982), Ghost in the Shell explores what it means to be human in our increasingly technologically-driven age. The Puppet Master has been hacking folks’ brains and implanting false memories for his/her own selfish purposes. Clearly, someone has got to put a stop to this. That certain someone is Major Motoko Kusanagi, a female cyborg who leads a team of counter-terrorists dubbed “Section 9” as they patrol the mean streets of New Port City, an urban locale visually modeled after Hong Kong. Backing her up is Batou, a cyborg who carries a torch for the Major, and Togusa, an affable family man who has refused all cybernetic enhancements and even carries an old-fashioned revolver as his weapon of choice. Ultimately, the members of Section 9 find themselves on a collision course with not only the Puppet Master, but something far scarier – the big questions about not just the meaning of life, but what qualifies as “life” at all. Despite its cult classic status, Ghost in the Shell is the kind of film that excels at “passage work,” but doesn’t exactly cohere. The movie is comprised of more than its fair share of crucial but lazily executed scenes of philosophical introspection, punctuated on occasion by moments of brilliant action, impressive animation, and a wholly immersive world that successfully mixes film noir with cyberpunk. But like Blade Runner, the film can also seem cold and alienating, perhaps in part due to the lackadaisical, largely disembodied feel of the English dub. 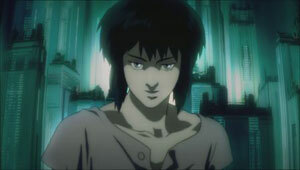 Although far from perfect, Ghost in the Shell holds on to its status as a true anime classic and the crux of its storyline remains relevant even to this day. The film’s ending actually anticipates current fears (and hopes) about the approaching real-life event known in some circles as “The Singularity” – the inevitable moment in human history when artificial super-intelligence comes to the fore. Notes:  In 2008, Oshii released Ghost in the Shell 2.0., which added new 3-D CGI effects, a snazzy new color palette and various other technical tweaks. Although a good deal of these additions are welcome changes to the original, in this reviewer’s opinion, the CGI work comes across as both obtrusive and incongruous when juxtaposed with the traditional 2-D animation that remains in the film, creating a jarring clash of visual styles. Oshii would have been better off either redoing the entire film as a full 3D CGI project or only making subtle enhancements to the onscreen visual effects.